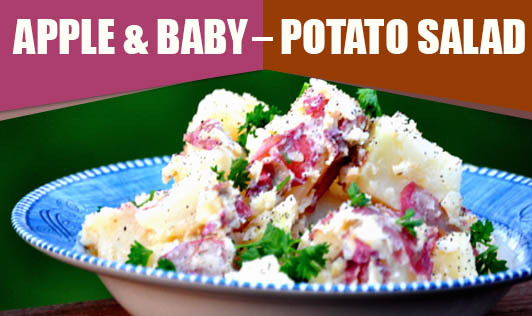 This salad provides a tasty alternative to the regular potato salad. Apples add a sweet crunch to every bite of this light potato salad. 1. Add 4 cups of water to a pan with 1½ tsp of salt. Add the baby potatoes and bring it to a boil. Lower heat and cook covered until the potatoes turn fork tender. Strain it. 2. Core apples and cut into ½" cubes without removing the peel. 3. Place potatoes and apples in a mixing bowl. Add ½ tbsp oil and lemon juice. 4. Add salt and pepper, and mix well. Cover and chill in the fridge for 1 hour. 5. Just before serving, add the mayonnaise/hung curd and ½ tbsp oil. Gently mix and serve immediately.